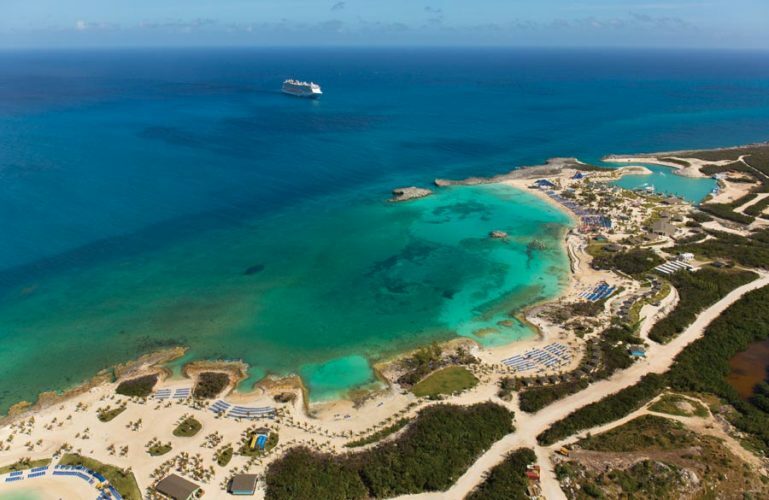 Tucked away at the tip of Berry islands, is Great Stirrup Cay, Bahamas. One of Norwegian Cruise Line’s private islands. You have probably heard about it since it was the first island ever to be turned into a private cruise port. Bought in 1977, from Belcher Oil Company. 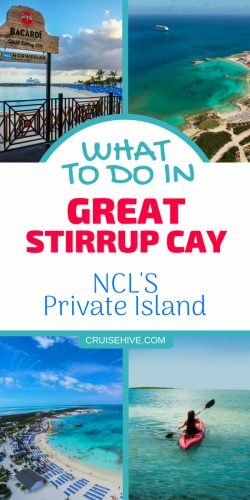 This private 250-acre island is home to a lush coconut plantation, white sandy beaches, crystal clear blue ocean waters, a wide variety of sea folk, and the lucky guests of NCL. With all these features plus the $25million worth of facilities and amenities that NCL has built on the island. It’s no wonder the cruise port has so many fun activities to engage in. Start your day simple, by first visiting and familiarizing yourself with the port. Ship’s visiting GSC dock some distance away from the port. Leaving cruisers to tender there. A great thing, however, is that Norwegian Cruise Line uses very large tendering boats, and the trip only lasts 10 minutes long. This reduces unnecessary delays. Enjoy the view of the island’s coastline and its aroma while boating in. Once at the port, a security area ushers you into the beautifully designed port center. This center features modern cruise port facilities including 3 restaurants, 5 bars, and a shopping market with small colorful stalls. There are also water equipment rental shops, bathroom amenities and of course beaches. You can explore this small island in less than 30 minutes via walking or renting an ATV. There are also beach wheelchairs, available for those with mobility issues. A hard-paved path takes you to all the main facilities in the port. The rest of the island features sandy paths which are easy to walk on. The port is adorned with palm trees, colorful flowers, and Caribbean plants. There are lots of birds, lizards and small island creatures that you are bound to catch a glimpse of, once in a while. Enjoy your day at the port, shopping, eating, and exploring the island. And jamming to the rhythmic Caribbean tunes coming from the DJ’s booth at Barcadi bar. Other than this, you can head on over to the beach. The main attraction at Great Stirrup Cay is the beach. This port hosts three beautiful fine-white-sandy beaches. Starting with the beach nearest to the pier, Bertram’s beach. Named after the British naval commander who settled on the island in the 18th century. Bertram beach is filled with beach loungers and hammocks under the scattered palm trees. But in order to get the best sits, found under the shaded areas, ensure you arrive early at the port. Choose from these beach accessories from Amazon. The waters on GSC port are crystal clear, and there is plenty of opportunities to snorkel in the area. Enjoy a good swim or just float around on a float-pad. There are bars near the beach like the Bacardi bar and Patron’s bar. Where you can grab a cold drink and enjoy your day, soaking in the sun, in this beautiful place. You can break the beach bum routine by engaging in a game of volleyball on the beach. Or head out to the rocks in the water for a climb and more sunbathing. Remember to wear good water shoes, however. For the best snorkeling experience try the waters adjacent to the jetty. Bertram while a good beach gets crowded fast, especially if there is more than one cruise ship at the port. For a less busy beach, try fiesta beach, which is the furthest from the pier. It is also a great hanging spot and is near the rockier landscape but entirely worth it in terms of less movement and noise. Buy your sunscreen from Amazon by clicking here. On the ship, it can be expensive. The middle beach known as cabana’s beach spots a row of beach cabanas on a raised, hilly area on the beach. This is where people who have rented beach cabanas hangout. Since it’s an extension of Bertram’s beach, you can expect the same features. Whichever beach you find yourself at, you are sure to have fun soaking in the sun and playing in the water. Get to the beach early and rent a clamshell at roughly $30 to avoid getting roasted on the hot Caribbean sun. While most cruisers shun cabanas, for being expensive, you will have to make an exception in Great Stirrup Cay, Bahamas. 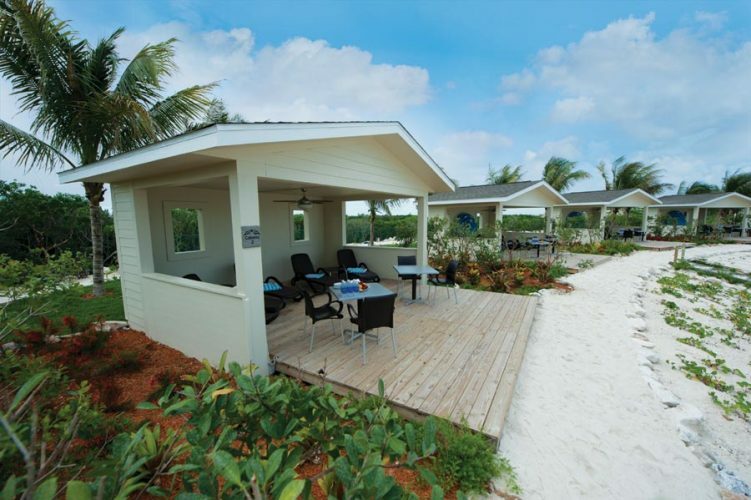 The cabanas on this port, found in Bertram’s Cove and Fiesta beach are worth every penny spent. These beautifully designed Cabanas, with exotic Mahogany finishing. Feature a large L-shaped couch that can fit close to 10 people easy. A coffee table, a mini fridge for cooling your water in, a ceiling fan, four lounge chairs on the porch area, 4 floating pads, fresh towel supply, snacks, a bowl of fresh fruit, dedicated waiter service, extra $50 credit for food, and a private shower on the back. Pre-order a cheese board, sushi or tacos and find them waiting for you in the Cabana. And start your GSC port day in style and in a party mood. There is a bar close to the cabanas, so you are never too far away to quench your thirst with colorful island drinks. The large cabanas go for $319 while the smaller ones go for $299. The difference in price dictating how many people they can host and where they are located. 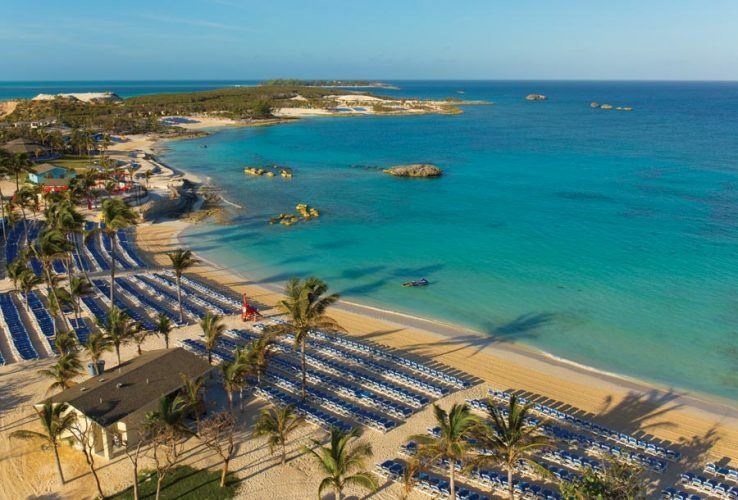 Escape the intense Bahamas sun and enjoy your day in these perfect beach cabanas, enjoying the scenic views in front of you, and the royal pampering you get from the NCL Staff. NCL went an extra mile and created a concrete underwater sculpture garden. Located at Bertram Cove, this garden which offers snorkelers something to keep themselves busy with. Features rock statues of mermaids, sea creatures, fountains, and urns. Book an excursion to this underwater garden at just $29 an adult or $15 a child for a day pass, and snorkel at this beautiful spot as much as you want. We suggest you buy a waterproof case to protect your very important phone! Have your cameras ready to take water selfies with the shoals of fish that hang out at the garden and other common sea folks like lobsters, crabs, and shrimps, which peer at you from the crawls and cracks in the statues. For thrill seekers. Strike flying above the ocean on a parasailing adventure of your bucket lists. By engaging in this thrilling activity. Soar 400 feet above ground, over the Bahamas Waters, while a sturdy parasail boat pulls you. Enjoy the scenic views beneath you, with the bird’s eye view you get from this excursion. Before beginning this tour, a guide will take you through a brief safety orientation and then speed out into the waters for the fun to begin. This ride will part you with a cool $99, but oh well. It’s a once in a lifetime sort of an experience, so why not? Good water shoes are a must, get yours from Amazon right here. Come back to the earth and go on a speedboat ride zooming past the coastlines to stingray city. This guided tour will take you to the home of some harmless southern stingrays. You will have a brief safety and instructions meeting, before going into the shallow waters off a cove. The water there is 7-8 feet deep reaching waist length. You will have an opportunity to pet, feed and have a snap moment with these majestic creatures. This 1-hour excursion will cost $69 for an adult and $49 for a kid. Take a tour of berry islands on a wave runner (similar to a jet ski). If you are acquainted with this water ride, then show off your prowess and riding skills riding at whichever speed you choose. You can ride the wave runner on your own or with a driver at an added cost. This tour will take you to some touristic sites, like the lighthouse, slaughter harbor or cistern cay an abandoned island community. You will, however, part with $99. whether a child or an adult for this ride. Visit the coral reefs of the Bahamas in this one-hour snorkeling excursion. This guided trip will start with a boat ride out to some of the amazing far away coral reefs. Once there, you will snorkel and explore the different variety of fishes in the Bahamas. You can bring your own snorkel gear (highly recommended) or use the ones provided by the excursion. This trip even takes you on a fish feeding adventure. Find travel snorkeling gear from Amazon right here. Later after snorkeling, you can relax at the sandbar, floating on the crystal-clear water, sipping a cold rum punch drink at the swim up bar. The first drink on this island is complimentary, the rest are sold at happy hour prices. This excursion will cost you from $59 both you and or a child. This is for the laid-back folks, take this relaxing lazy tour of the marine life around berry islands. This guided excursion uses a modern catamaran boat. A naturalist on the tour will teach you about the different sea animals you encounter, and the ecosystem at GSC. Carry a good waterproof camera and take pictures of various sea animals, and the scenic coastlines you cruise past. Explore sea animals housed in a tank in the catamaran up close. You can touch, pet and feed those harmless, friendly sea creatures. Rent a stand-up paddleboard at $25 and glide smoothly along the coastline enjoying the scenery. Exploring the marine life underneath the water, while maintaining your balance on this chill ride. 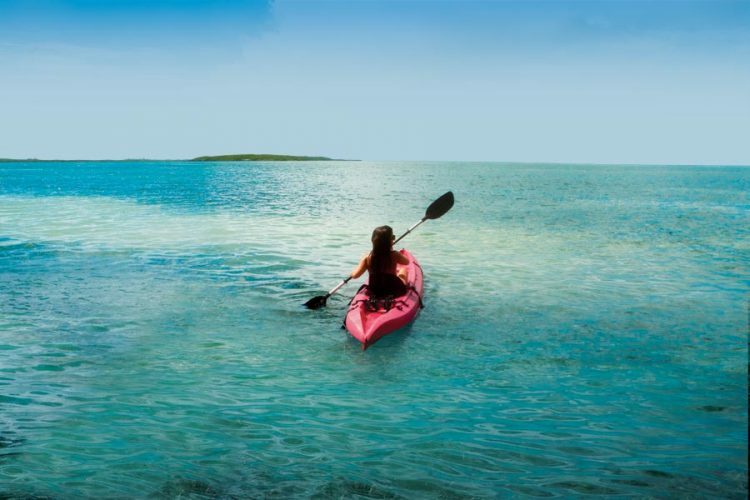 Or take a kayak tour, of the waters on the southern side of Great Stirrup Cay. After a brief orientation on how to use your two-person kayak, you’ll paddle over the shallow waters where you may encounter a variety of marine life. The guide will show you the marine life, tell you a bit about the island and its marine life. Enjoy the scenic views on this guided leisurely kayak tour. A visit to the Bahamas is never complete without a souvenir. Head to the marketplace on your way back to the ship, or any other time. There you will find beautiful unique paintings, wooden carvings, clothing, woven items and sculptures to take home. This is also the best place to shop for that perfect gift to take to your friend or family back at home. Find all your Bahamas Souvenirs by clicking here. Enjoy a hearty serving of popular food like burgers, pizza, hot dogs and grilled chicken or steak. The island has 3 buffet areas, where you can grab a meal from. Lunch starts from 11.30 a.m. to 1.30p.m. The main eating area is at Jumbey restaurant. Where they serve BBQ burgers and hot dogs, with a variety of drinks. There are 4 queues at this restaurant, the two queues in the front of the place are usually the longest, try the ones on the side, which are shorter to get food faster. Also try Abaco Taco, a new restaurant in the island, that allows you to make your tacos, with a variety of fillings. They also make great fruity concoctions. This place is worth a visit even if for a single drink only. 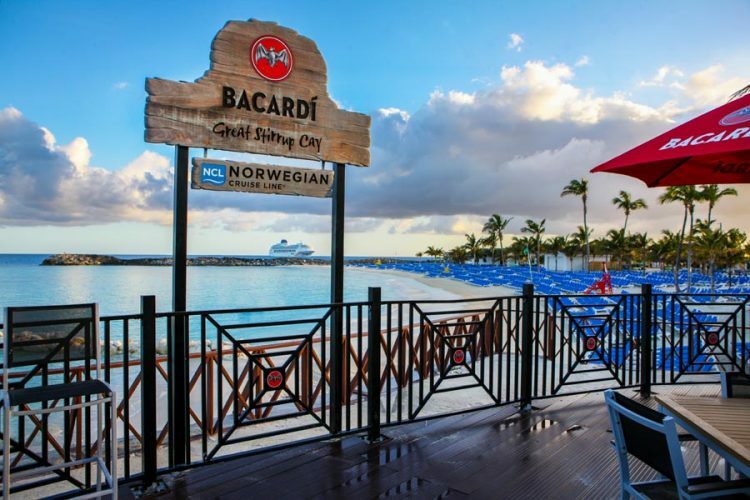 On the drinks end, there are five bars on the island, starting with the very energetic Bacardi bar. Where you can hang out as well as enjoy a drink. It has a large seating area and a raised stage for the DJ’s booth who churns out some cool island tunes. Other bars in GSC include lighthouse bar and patron’s bar. GSC just like most cruise stops in the Caribbean enjoys a warm tropical temperature all throughout the year. The Temperature at GSC averages at 77°F yearly. The warmest months are from May to October which experience highs of between 86°F- 90°F temperatures. While the coolest months are from December to January, with temperatures falling to as low as 66°F. As is common with the Caribbean, GSC also experiences the paradoxical weather where it’s wet in the summer and dry in the winter seasons. So, visiting the island will depend on whether you mind the rain or not. The cold\dry season is from November to March, while the summer\rainy season is from May to October. The seawater is warmest in the summer season, with high temperatures of up to 86°F in August. Don’t forget to carry and reapply sunscreen as often as possible. The wave runner excursion needs a valid driver’s license. Don’t forget to carry that. Carry cash for the local market on the port, they don’t take your ship card or credit card. And lastly, remember to wear good water shoes. 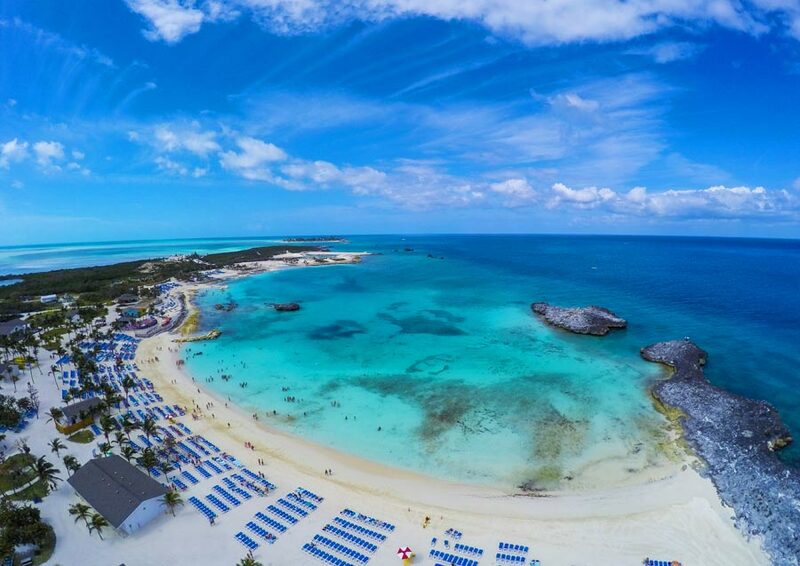 With all these information, we believe you are now ready to have the best time you can at Great Stirrup Cay, Bahamas. So, we wish you all the best. Happy Cruising! !